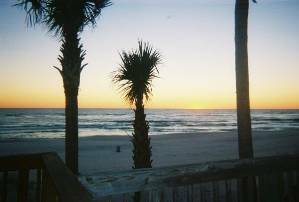 attractions and favorite spots in Panama City Beach. king size bed in each bedroom with its own private bath. 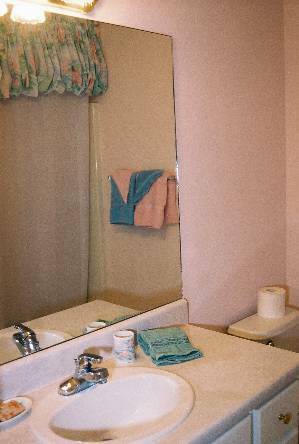 The Master bath features a whirlpool tub and skylight. week. There is not a TV in the third bedroom. the breeze blowing off the water. Publix, Super Wal-Mart are all close-by. pack light and toss the kids clothes in the washer). inch flat screen TV that is great for movies or sports. The townhouse is beautifully updated. Heaven here on earth in Panama City Beach. From 9 months to 90 years, Panama City Beach offers activities for kids of all ages. Throughout the year, Panama City Beach hosts several big special events. For the young at heart, there's amusement parks, miniature golf, a zoo excursion, museums, a water park, swimming with the dolphins and much more! Ready to unwind after a hard day of playing in the sand and surf? Experience some of the great Beach and Night Clubs Panama City Beach has to offer. Or, for those who want to get back to nature, choose from a variety of Day Trips and State Parks. If diving or snorkeling is your thing, see why Panama City Beach is called "The Wreck Capital of the South". There's something to entertain everyone here! One mile from Pier Park. Enjoy beautiful sunrises and sunsets from your own large deck. Full bathroom downstairs for guests staying on the sleeper sofa. Large deck (17'x12') has patio furniture (umbrella not shown) and gas grill. 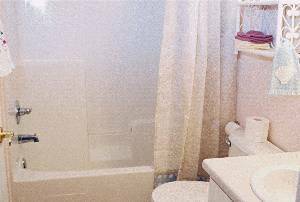 Spacious guest bathroom features tub/shower. 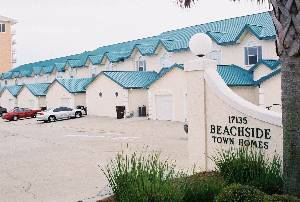 Beachside Town Homes are 7 years old and are very clean, quiet and secure. We just returned from our vacation in Florida and absolutely loved every aspect of our stay. The townhouse is so beautiful! 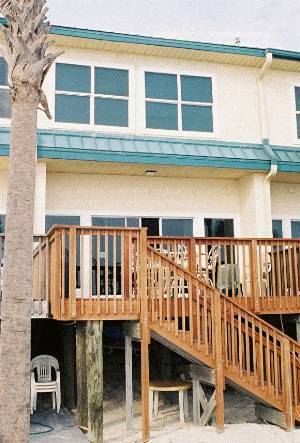 My husband loved the deck with the grill, my three daughters loved having the beach just steps from the back door, and I loved the convenience of the upstairs washer and dryer. We will definitely stay here again! We just got back from a week stay and we didn't want to leave! The townhouse is beautiful and so is the view! It was so nice to walk out the back door and in just a few steps be on the beach. The location was great, too. Not too far down into the busy area but not too far out either and right across the street was a Winn Dixie. This was the best place we have stayed yet and we already are ready to come back! Thank you for sharing your beautiful home! We just returned home from our 10 day Easter vacation at your condo in Panama City.(4/12-4/22). We have stayed in various condos in many different cities in Florida with our 3 children ages 8,14&16 and have never experienced a vacation like this one! This was without a doubt the best equipped and nicest one ever. There was nothing we needed that wasn't already there. We cooked every night as if we were in our own home with everything at our fingertips. We enjoyed the white sandy beach right off the very comfortable back deck and not once did I hear Mom I'm bored, that in itself is amazing considering the age range of my kids. We rented jet skis, went snorkeling,went on the screamer boat ride and those are just a few of the many things we enjoyed. We will definatly return again next year for family vacation. We stayed at this townhome week of March 18-25.It was beautiful,large and very clean.Very comfortable beds.We enjoyed the nice deck with stairs to the beach.,recliners in living room were great to have too!Very enjoyable and relaxing week away from all the constuction but close to everything.We would stay here again. We stayed at this WONDERFUL home in October with our two small children. We had an amazing time and the townhome was everything we hoped for!! The beds were great, the bathrooms perfect, the linens were soft and the towels fluffy. The kitchen was well supplied as well. And we should have packed only 1/3 of what we did because of the super convenient full size washer and dryer! You truly do just step off the deck onto the white sands of the beach. Very quiet and very relaxing!! The views of the sunset were unbelievable from the bedroom, the living room and the deck. The townhome was away from the majority of the construction that is everywhere in PCB. We will go back and stay whenever we can! 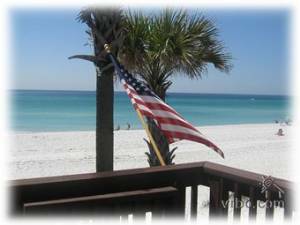 PANAMA CITY BEACH VACATION RENTAL RATE INFO 1. Minimum rental age is 25 (families with children are welcome). We DO NOT RENT to single students under 25 years of age. 2. Until confirmed, rates subject to change without notice. 3. NO SMOKING INSIDE (smoking is allowed on the deck or front stoop.) 4. Night rentals have a 3 DAY MINIMUM stay. 5. 12% Florida Tax and $90.00 Exit Cleaning Fee 6. $200.00 Returnable Damage/Reservation Deposit is required. The deposit automatically converts to a Security/Damage Deposit upon arrival. The deposit is NOT applied toward the rent; however, it is fully refundable within 14 days of departure provided NO DAMAGE is done to the unit above normal wear and tear. 7. Deposit is expected in full 7 business days OF BOOKING...payment in full is due 21 days PRIOR TO ARRIVAL. All rates are subject to change without notice. 8. In the event of CANCELLATION, a $25.00 Documentation Fee will be subtracted from the returned deposit. 9. Requests for a cancellation must be made a MINIMUM OF 30 DAYS (4 SATURDAYS) PRIOR to the contracted day of arrival or deposit will be forfeited. 10. Cancellations after arrival are limited to WEATHER RELATED FORCED EVACUATIONS BY PCB AUTHORITIES. 11. Small pets are allowed with a $125.00 per week PET FEE, second small pet $75.00 per week. Deposit: $300.00 booking/security deposit due within 7 days of booking. Refundable except for $25.00 docking fee if cancellation is within 30 days of check-in. Cancellations and Refunds: Refundable if cancellation is at least 30 days (4 Saturdays) prior to check in.